NEWARK, Del. (WPVI) -- Four people are hospitalized after a rollover crash in Newark, Delaware. It happened at 7:50 a.m. Monday on Chapman Road near Christiana Road. 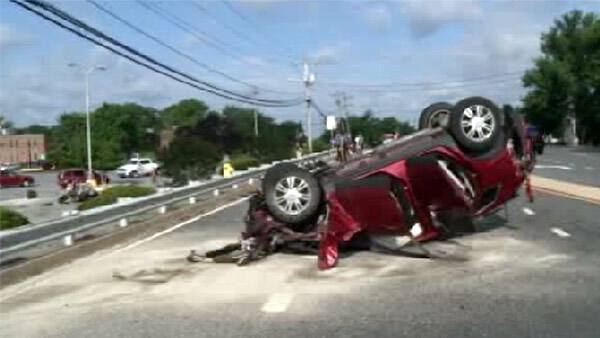 State police tell Action News two vehicles collided, causing one to overturn. A woman and two boys from the vehicle that flipped were taken to area hospitals, along with one person from the other vehicle. There was no immediate word on the extent of the victims' injuries, or on what led to the crash. The eastbound side of Chapman Road was shut down as police investigated. Motorists were being asked to urge caution when traveling in the area.